Bcm Verifies the received signal from the ignition key id, then informs ecm whether to allow engine start. Transmission range switch (cvt models) Detects whether the shift lever is in park. Clutch interlock switch (m/t models) Detects whether the clutch pedal is depressed. Dongle unit (canada only) Sends id verification signal to the bcm. Starter relay Supplies battery voltage to the starter motor when enabled. Nats antenna amp. Detects the ignition key presence in the ignition key cylinder. Security indicator Indicates the status of the security system. Ipdm e/r Supplies battery voltage from integrated starter relay to the starter motor. Engine immobilizer shows high anti-theft performance to prevent engine from starting by anyone other than the owner. Only a key with key id registered in bcm and ecm can start engine, and shows high anti-theft performance to prevent key from being copied or stolen. Therefore, nats warns outsiders that the vehicle is equipped with the anti-theft system. If system detects malfunction, security indicator illuminates when ignition switch is turned to on position. If the owner requires, ignition key id or mechanical key id can be registered for up to 5 keys. 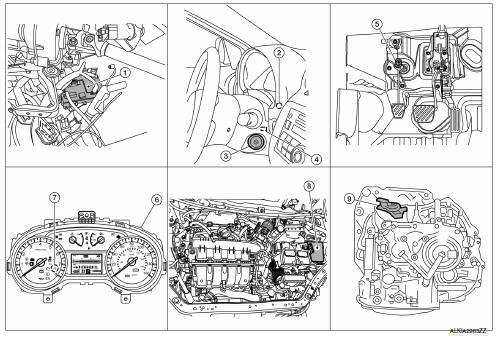 During trouble diagnosis or when the following parts have been replaced, and if ignition key is added, registration* 1 is required. *1: All keys kept by the owner of the vehicle should be registered with mechanical key. NATS trouble diagnosis, system initialization and additional registration of other mechanical key IDs must be carried out using CONSULT. When NATS initialization has been completed, the ID of the inserted mechanical key or mechanical key IDs can be carried out. Possible symptom of NATS malfunction is вЂњEngine cannot startвЂќ. Identify the possible causes according to вЂњWork FlowвЂќ, Refer to SEC-171, "Work Flow". 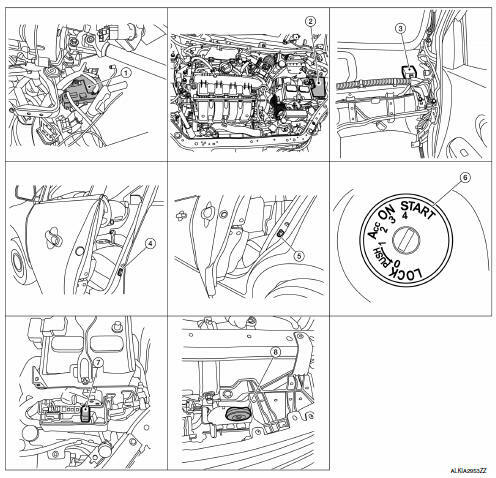 If ECM other than Genuine NISSAN is installed, the engine cannot be started. For ECM replacement procedure, refer to EC-485, "Removal and Installation". The key registration is a procedure that erases the current NATS ID once, and then re-registers a new ID. Therefore the registered key is necessary for this procedure. Before starting the registration procedure, collect all registered Keys from the customer. The NATS ID registration is the procedure that registers the ID stored into the transponder (integrated in mechanical key) to BCM. The key ID registration is the procedure that registers the ID to the BCM. When performing the key system registration only, the engine cannot be started by inserting the key into the key cylinder. When performing the NATS registration only, the engine cannot be started by using the ignition key. Always flashes with ignition key in the OFF position. It is necessary to perform NATS ID registration when replacing any of the following parts. If ID registration is mot performed the electrical system may not operate properly. The vehicle security system has two alarm functions (theft warning alarm and panic alarm), and reduces the possibility of a theft or mischief by activating horns and headlamps intermittently. The panic alarm does not start when the theft warning alarm is activating, and the panic alarm stops when the theft warning alarm is activated. The priority of the functions are as per the following. The theft warning alarm function activates horns and headlamps intermittently when BCM detects that any door is opened by unauthorized means, while the system is in the ARMED state. Security indicator lamp on combination meter always blinks when ignition switch is in any position other than on. Security indicator lamp blinking warns that the vehicle is equipped with a vehicle security system. 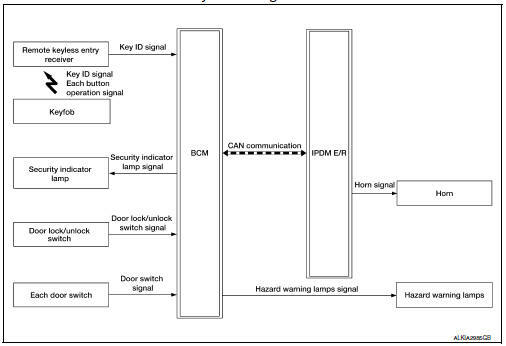 Bcm ignores the door key cylinder unlock switch signal input for 1 second after the door key cylinder lock switch signal input. To lock/unlock all doors by operating remote controller button of Keyfob, the Keyfob must be within the detection area of remote keyless entry receiver. For details, refer to SEC-141, "NISSAN VEHICLE IMMOBILIZER SYSTEM-NATS : System Description". The vehicle security system is not set in the disarmed phase. The vehicle security system stays in this phase while any door is open, because it is assumed that the owner is inside or nearby the vehicle. Security indicator lamp blinks every 2.4 Seconds. When the vehicle security system is reset, each phase switches to the disarmed phase directly. The PRE-ARMED phase is the transient state between the DISARMED phase and the ARMED phase. This phase is maintained for 30 seconds, so that the owner can reset the setting due to a mis-operation. This phase switches to the ARMED phase when vehicle conditions are not changed for 30 seconds. Security indicator lamp illuminates while being in this phase. To reset the PRE-ARMED phase, refer to the switching condition of No. 10 in the table above. The vehicle security system is set, and bcm monitors all necessary inputs. If any door is opened without using keyfob, vehicle security system switches to the alarm phase. Security indicator lamp blinks every 2.4 Seconds. To reset the armed phase, refer to the switching condition of no. 11 In the table above. BCM transmits вЂњTheft Warning Horn RequestвЂќ signal and вЂњHigh Beam RequestвЂќ signal intermittently to IPDM E/R via CAN communication. In this phase, horns and headlamps are activated intermittently for approximately 50 seconds to warn that the vehicle is accessed by unauthorized means. ON/OFF timing of horns and headlamps are synchronized. After 50 seconds, the vehicle security system returns to the ARMED phase. At this time, if BCM still detects unauthorized access to the vehicle, the system is switched to the ALARM phase again. This RE-ALARM operation is carried out a maximum of 2 times. 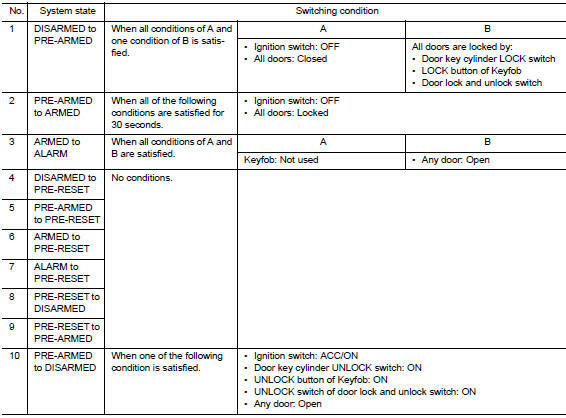 To cancel the ALARM operation, refer to the switching condition of No. 12 in the table above. If a battery terminal is disconnected during the alarm phase, theft warning alarm stops. But when the battery terminal is reconnected, theft warning alarm is activated again. The pre-reset phase is the transient state between each phase and disarmed phase. Pre-armed phase is not available for this models. The panic alarm function activates horns and headlamps intermittently when the owner presses the panic alarm button of keyfob outside the vehicle while the ignition switch is off. When bcm receives panic alarm signal from keyfob, bcm transmits вЂњtheft warning horn requestвЂќ signal and вЂњhigh beam requestвЂќ signal intermittently to ipdm e/r via can communication. To prevent the activation due to mis-operation of keyfob by owner, the panic alarm function is activated when bcm receives the signal for 0.4 - 0.6 Seconds. Panic alarm operation is maintained for 25 seconds. Panic alarm operation is cancelled when BCM receives one of the following signals.